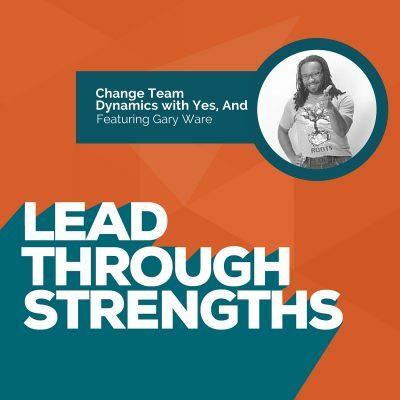 This month’s episode features Gary Ware, whose mission is to help people “energize their work.” If you find that your job is sometimes humdrum, and that your team’s ability to create new, innovative ideas is stifled, then this is the episode for you. Gary provides practical tools (and cool examples) you can use to get creative juices flowing. And, there’s even a bonus – tips to improve your interviewing skills. You can use those tips on both sides of the proverbial interviewing table. Use this lesson from Improv: be in the moment and be fully present. If you’re not fully engaged, your ability to contribute to a proposed idea will be limited. Gary and Lisa both practice the concept of “soft focus” that comes from improvisation. In practicing soft focus, you’re fully tuned into what’s going on in the room. Rather than thinking about what you’re going to say next, you’re fully there with the intention to listen and soak in what’s going on around you. Use the words“Yes, and…” instead of cutting off someone’s idea with a “Yes, but.” Make an effort to see where the idea takes you as a group, and don’t deviate from a concept until it’s fully played out. Ideas are different from execution, yet often people squash ideas by thinking about impractical execution details as ideas get launched. This is why you hear “Yes, but” so often in meetings. The challenge is that ideas need space. When a team member thinks his idea will get slammed, he won’t bother throwing it out. And his idea might just be the one that inspires his teammate’s genius breakthrough that would have come 7 ideas down the line. Notice what works. When you keep going, and when you get stuck, that’s where you get the amazing stuff! Spend time debriefing as a team. Talk about what brings out your biggest ideas. Talk about what makes you feel your best. Share moments of success because noticing what works will help you get more of what works. Accepting and considering ideas, no matter how crazy, will lead you to innovation and creative breakthrough moments. Allow yourselves to get stuck so that you can get to the breakthrough. Don’t disregard them. Take the word “but…” out of your vocabulary entirely. That’s just another way of saying no. It’s a way of disregarding a person’s contribution, which may inhibit them from speaking up when they have their next incredible idea. Many leaders and team members think they’re being practical when they pick ideas apart. On the surface it feels like a way to quickly cull and make decisions. Yet actually, it creates a situation where people don’t want to speak until they have a great idea. Find your openness. Enter creative sessions with a sense of curiosity and possibility. If needed, tell everyone that this meeting isn’t about making a decision. Tell them it’s about coming up with ideas. If needed, create a silly mantra like “thank you for that idea” that everyone says in unison after every idea. Rather than commenting on an idea, you simply thank them, accept the submission and keep moving to the next idea. That way, you’re not categorizing ideas as good and bad, you’re simply generating the list of ideas. Step into their shoes. Remember that we all see things through different lenses. Try to see ideas and concepts as others do. Consider that their perspectives, assumptions, and experiences are leading them to show up with a unique perspective. Using this mental practice is great for team building because it asks you to consider how someone else might view a project or problem. If you are thrown off during an interview, compose yourself and be real. If you don’t know an answer, be honest. They’ll know when you’re flustered, and making up an answer is not a good option. Hiring managers want to know who you are. They want to know how you work. With all things being equal, people are going to hire those they like, so be your true self. Your resume tells them what you’ve done. That’s easy enough to read, so use the interview to show the who and how. If you’re a hiring manager, try the Monkey Wrench Game that Gary and Lisa demonstrate during the episode. This is a tool you can use in an interview to see how someone thinks on the fly. And like the Plato quote above, you can tell a lot about a candidate through their play. If you manage a team, try the activities that Gary and Lisa demonstrated in a team meeting. These Improv exercises are a fun way to do a five minute team building exercise at the beginning of your next team meeting. They’re a great way to set the tone for a creative, collaborative conversation. Objective: Hold a 1×1 conversation between two people at a time with no pre-planned expertise or interview questions. Time: 10 min. This could take 30 min or an hour if you have a large team. Be sure to set the stage so people know they should try to keep their answers to 1 minute or less. An average-size team will be finished in 10 minutes + instruction time. Purpose: Get your team in the moment and fully present so that they “Yes, And” their way to a full conversation. The purpose is to generate collaboration, ideation, support, creativity, and of course…fun. Preparation: Bring a pad of sticky notes. Get two volunteers. One person will be the interviewer, and one will be the first interviewee. The interviewer will be the same person during the entire game. This person should be a good communicator who will enjoy being part of the exercise the entire time. The interviewee will change after each question, so each team member will take a turn. Tell the team that you’ll be building on a conversation (a mock expert interview) as you go person by person. Encourage them to call back to each other’s references. Ask them to try to transition into their response seamlessly, as if it is one conversation. Do a quick demo so they get the idea before you get started. Ask each person to write one noun on one sticky note and one verb on a second sticky note. When people are finished, have them put those on a wall or in the middle of the table where everyone can see. This is your pile of inspiration words. Then the interviewer asks the new person a question about that word. The interview continues until all teammates have answered a question. Key: this needs to feel like one conversation. That’s where the Yes, And comes into play. Try to transition into their response seamlessly, as if it is one conversation. On a flip chart or whiteboard, write, “I think you should also talk to my friend [teammate’s name] he/she is an expert when it comes to [word]” – this will help them remember how to generate the handoff from one interviewee to the next. Ask how that exercise mimicked things that happen at work on a regular day. Ask what it felt like when the transitions were natural and tied together. Ask what it felt like when someone abruptly moved to the next topic in the interview. Note: the lesson you’re drawing out is what it feels like when you use “Yes, And” to collaborate and build on each other’s ideas. It’s to talk about what it feels like when you show up as a fully present participant who accepts what “is” and moves forward from there. If you have a team with a lot of emotional baggage or a habit of squashing infant ideas, this would be a great exercise. Objective: Hold a conversation in pairs where the storyteller flexes the story based on random words inserted by the randomizer. Time: 3 min + instruction time. Purpose: Get your team out of an over-analyzing mode; practice full presence; have fun; practice adaptability and innovation; experience change with no luxury of planning. Preparation: Get a timer. You can likely use the stopwatch feature on your phone. Have everyone pair up. One person will be the storyteller (this is the role Lisa played in the example in the episode). One person will be the randomizer (this is the role Gary played). Ask them to decide who will play which role for their 3 minute story. Do a quick demo so they get the idea before you get started. Tell the storytellers that their job is to tell a story that begins with “once upon a time…”, to try to create some excitement in the middle, and to bring it to a close in a relatively short period of time. Tell the randomizers, in advance, to think of 5 unrelated words. Have them write them on a piece of paper that only they can see. Tell them that their job is to insert those words randomly in the middle of a sentence (not the end) while the storyteller is talking. The storyteller’s job is to accept the word and smoothly weave it into the story. Tell them how you will call them back together. All pairs will be talking at once, so the room might get loud. Tell them how to know it’s time to cut off their story if it hasn’t finished when you call time. Key: this needs to feel like one story. That’s where the Yes, And comes into play. They’re practicing the idea of changing direction quickly, and not being able to plan their responses. Start off by hearing a couple of the interesting story topics they covered. Ask who wants to do a 15 second story synopsis. It’s fun hearing that one group talked about aliens inventing a revolutionary code that will forever change software development, whereas another group talked about hardcover books being distributed by orphaned dolphins who swam with the books on their fins. Ask how that exercise mimicked things that happen at work. Ask what it felt like to the storytellers when they had to shift the story into an unexpected direction. Ask what it felt like to the randomizer to hear where the story goes versus where they expected. Ask what was difficult; ask what was easy. Note: the lesson you’re drawing out is what it feels like when you’re fully present–when you come without assumptions or expectations about what’s next. And you get to experience what it’s like being fully in the moment. It’s not to show that future thinking or learning from past failures is bad. Of course, if you know us at Lead Through Strengths, you’ll know we love the talents of Futuristic, Context, and Strategic. Instead, this is to get people to also experience what it feels like to be fully present in the moment and to support ideas in a different way. If you have a team with a lot of competing priorities and distractions, this would be a great one. Using these tools and techniques helps teams create and innovate, while allowing all people to feel valued and appreciated. To connect with Gary, check out his website, and follow him on twitter. Remember, using your strengths every day at work makes you a stronger performer. If you’re always focused on fixing your team’s weaknesses, you’re choosing the path of most resistance. Go claim your talents and share them with the world!